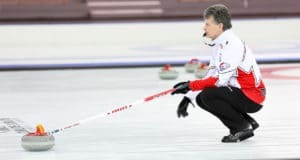 Husband and wife team, Wayne and Kim Tuck of Ontario’s Ilderton Curling Club are the 2014 Canadian Mixed Doubles champions after defeating KaLynn Park and Charley Thomas in Sunday’s final at the Ottawa Hunt and Golf Club. Twelve teams qualified for playoffs, out of the starting 32. The first round of playoffs saw four teams advance to the quarter-finals. Those advancing four teams met up with the winners from each of the four pools. Three of these four were undefeated in their seven-game round robin. Pool winners were, first, John Morris and Heather Smith (7-0), followed by Charley Thomas and KaLynn Park (7-0). Third pool winner was Mike Armstrong and Ashley Quick from Saskatchewan (7-0) and finally Wayne and Kim Tuck from Ontario at 6-1. Those four pool winners also advanced to the semifinals where Morris/Smith were defeated by the Tuck/Tuck team on last shot in a thrilling game. Both matches (the other with Thomas/Park playing Armstrong/ Quick) were tied coming home. KaLynn Park made a perfect draw to the four foot (with backing)against two to win that semifinal. So, the final game set up to be another beauty match. The Tucks played great against Morris and Smith and promised to be tough to beat. But the Thomas-Park team had yet to lose. 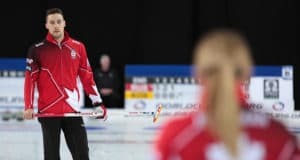 They were playing eight ends of Mixed Doubles for a trip to beautiful Dumfries, Scotland to compete in the World Mixed Doubles Championship April 23-30. Thirty-four teams are entered in the World Mixed Doubles: two pools of nine and two pools of eight. Canada is in with some tough countries in this discipline. Sweden, Scotland and several countries from Europe play this game well. The final game began with last rock advantage going to the Tucks, who had won the draw to the button. The teams exchanged deuces with their last rocks in the first two ends. Thomas-Park stole the third when KaLynn glued one to the Tuck rock just back of the button. An in-off couldn’t remove it. In the fourth, the Tucks had a great end built and Kim’s draw to the four-foot converted it for a four-ender, to make the score 6-3 for the Tucks at the fourth end break. A mess of rocks in the four-foot in end five left Tuck shot one and guarding. Park had almost no shot but tried to run a guard back with no success. One more for Team Tuck and a 7-3 score. That sounds like a big lead but the round robin saw five six-enders scored during the week. Nothing is safe! The sixth end featured a lot of thinking and Team Tuck was getting short on time. KaLynn missed a come-around tap (wrecked on the guard thrown by Kim) for four with her last shot and ended up getting only one. The Tucks dodged a bullet and went up 7-4 playing seven. In the seventh, Kim Tuck made a wonderful finesse tap for one with last shot extending their lead to 8-4. 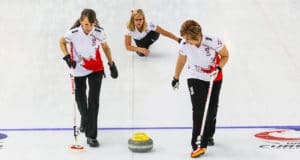 In normal curling that would be enough. In Mixed Doubles, there is always a hope, but these teams have become much more proficient at defending a big lead. It was a mess as Kim Tuck went to throw her last shot. KaLynn Park had a shot for a bunch, which she missed by an eye-lash. Team Tuck won in a very exciting final. Canada will be well represented by this team in Scotland. Congratulations to the Ottawa Hunt Club for providing an outstanding venue….and to Bill Duck and his ice crew for terrific ice….perfect for Mixed Doubles.